Despite the fact that I have newer camera bodies with better specs, there are many times when I have one of my older Canon DSLR bodies around for taking pictures. While my newer cameras use SD cards, the older bodies are still using Compact Flash, which means I can’t quickly transfer the files off to my Windows 7 computer without a card reader. Or at least I thought that was the case. Canon’s EOS utility, which comes in the camera box, will also work for connecting the camera, but if you’re like me, you have no idea where that disk is. While Canon offers no easy compatibility for the Canon 20D and Canon 5D, as well as a few other models, there is a quick and easy workaround. As I pointed out before, the best solution is to use a card reader if you’ve got one. It doesn’t drain the camera battery and I’m finding it less likely to have a mini-USB cable on hand. Of course, if you’re looking for Windows 7 drivers for your camera, you probably don’t have a card reader on hand. 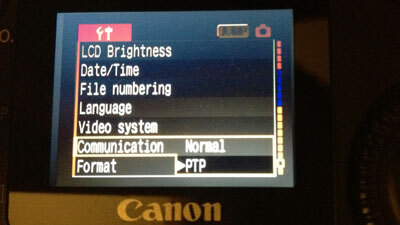 Canon doesn’t document this as an official solution, the easiest thing you can do is go to the Menu on the camera, scroll to the Communication setting, and change the setting from Normal to PTP. PTP, which stands for Picture Transfer Protocol, is a standard designed to be able to transfer photos without the need for a driver. While this may not work with every version of Windows, it works with all versions of both 32-bit and 64-bit Windows 7, as well as Windows Vista. While there aren’t any Windows 7 drivers for the 5D and 20D, you really won’t need them. Switch your camera’s communication mode and it will instantly be recognized.